Startimes Nigeria has reduced the subscription price for its classic bouquet from N2,600 to N1,900 and this reduction in price takes effect from September 1, 2018. 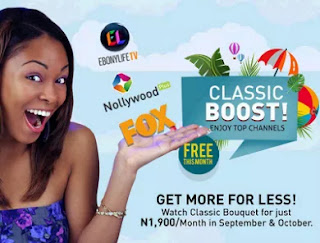 The PayTV network also said that starting from August 1, all customers will be able to enjoy one month Free-To-Air services on all channels including the newly added channels on Classic Bouquet which includes Ebony Life TV, ST Nollywood Plus and Fox and ST Kids to the bouquet. SEE ALSO: Four Ways To Recharge Your Startimes Decoder. 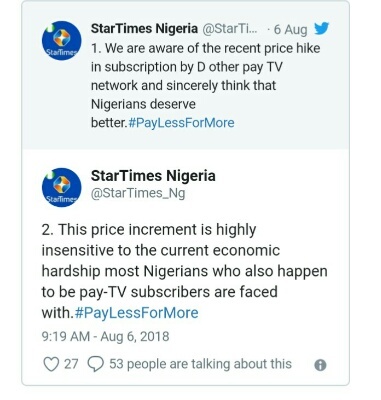 So guys if you have startimes Decoder, it's time to turn it on to at least enjoy the one month free to air services.